Small business owners of the world, unite! You are part of an apparently bottomless well of advertising dollars, and the big boys are out to take them from you. Today, in Misleading Advertising Sales…how Google would like you to calculate Return on Investment. Google has left the cost of goods or services out of their calculation. It could be an honest mistake, but this is a multi-billion dollar business, so I doubt that there is anything in the AdWords world that hasn’t passed muster with several layers of management. 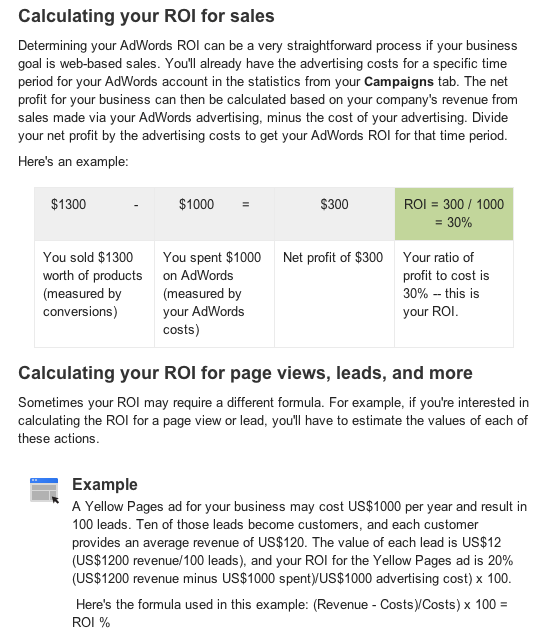 So Google seems to be deliberately misleading small businesses into calculating their ROI from AdWords campaigns incorrectly, making their AdWords investment seem much better than it really is. If Groupon doesn’t get you, Google will.